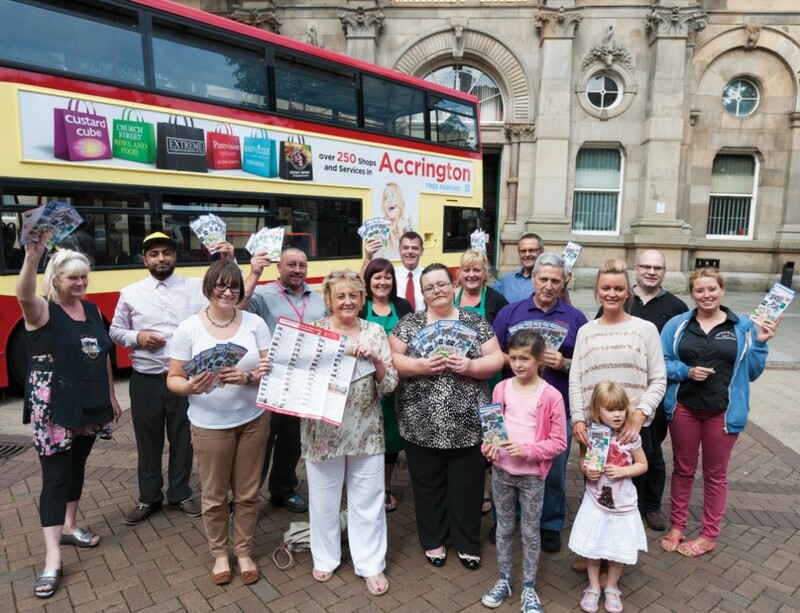 Accrington campaign launches with a bang! SDA has kicked off a campaign to boost ailing Hyndburn businesses with the launch of an interactive flyer being distributed to 37,000 homes. The flyer was launched to retailers, shoppers and councillors outside Accrington Market Hall as we unveiled a bus ad with Pilkington Buses, part of a campaign which will see ads running on the company’s Hyndburn Circular Route as well as selected Transdev routes. Designed, written and printed by SDA, the flyer features short YouTube videos of more than 50 town centre businesses we approached to join forces for the campaign – all images and videos were shot by us. Each business contributed a small fee to be included in the flyer, which also includes sections on the town’s history, leisure facilities and upcoming event’s in the social calendar. It follows the success of our Oswaldtwistle leaflet, which saw retailers enjoy a 50% upturn in trade. Cllr Clare Pritchard said: “We’re delighted to finally unveil the finished product to the public after months of hard work from everyone involved. A Twitter page has been set up to support the campaign – follow @AccringtonShops to stay up-to-date with the latest news or visit youtube.com/accringtontowncentre to view all of the videos. Cllr Clare Pritchard joins some of the retailers featured in the flyer at its official launch in Accrington. This entry was posted in Uncategorized on September 7, 2013 by admin.